We all get to a stage in our lives when we simply can’t stay standing for a very long time anymore. For some of us, this may come very early on through injury or disability, but for most of us, this will simply catch up to us with age and conditions like arthritis. This can make some everyday activities that require a lot of standing, such as cooking or showering, a real hassle. 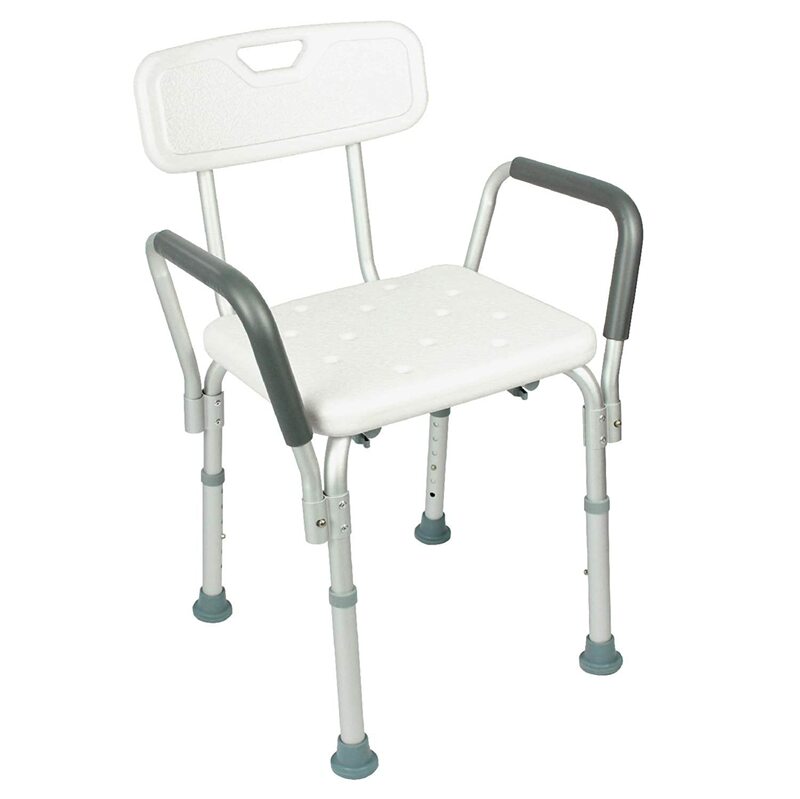 But there are a number of great bathroom aids that can help with shower, helping us to keep our independence and not have to rely on family members or professional care in order to have our daily wash. A good bathroom chair will certainly help keep showers a painless and enjoyable activity. 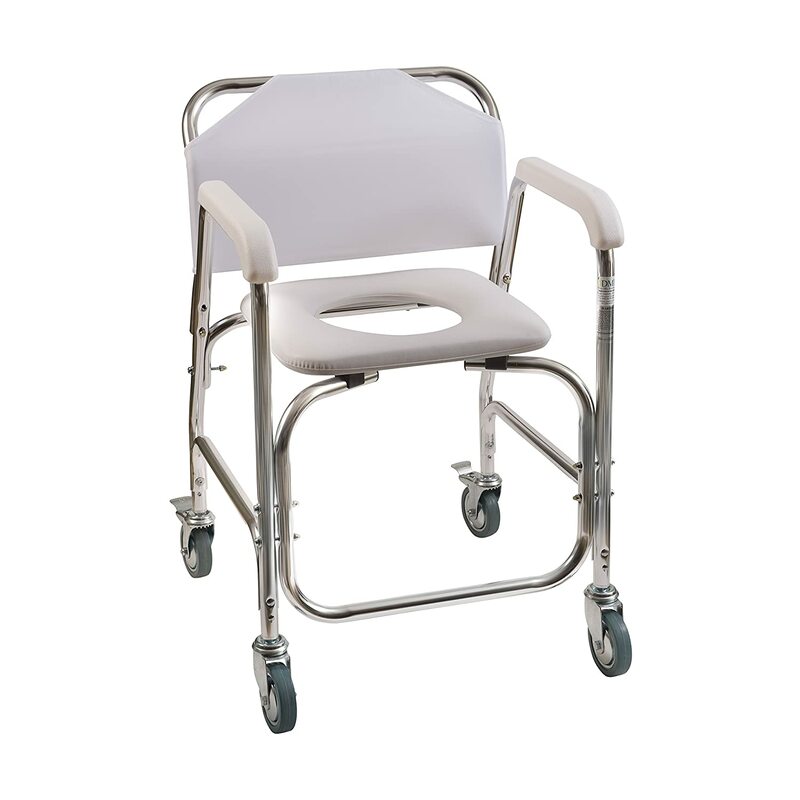 Shower chairs come in all shapes and sizes, and there are a number of different designs to choose from, all depending on the needs of the patient and the type of bath or shower that you have. Here at Apex Health and Care, we are fully committed to bringing you the best medical products in one easy place, so we’ve done our research on bathing chairs, and compiled a list of the best ones out there. 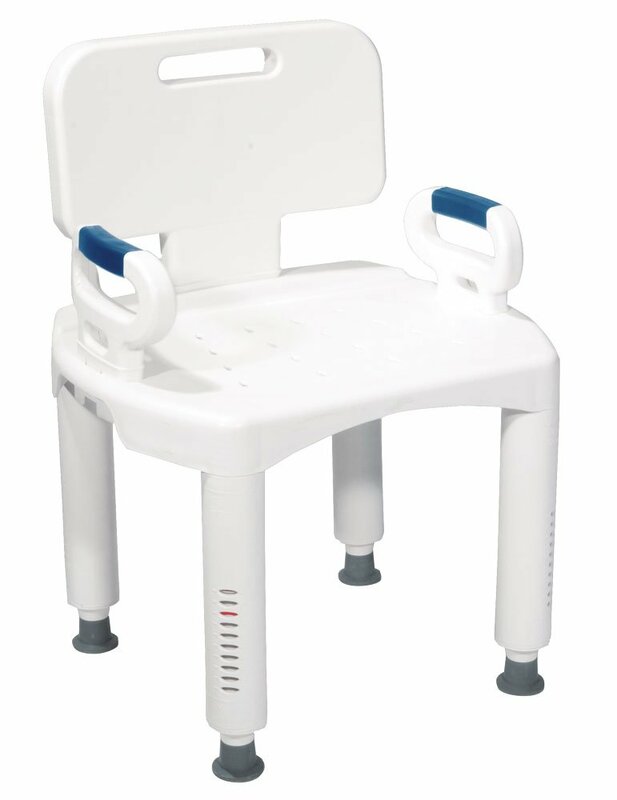 All of these chairs have been specially designed to meet the medical regulations, and they are of the highest quality in terms of construction and materials. so if you or a family member can’t stand up for that long without support, please feel free to have a look at what we have on offer; we’re sure we’ve got the right chair for everyone! Because no two customers are exactly the same, we’ve got lost of different designs to meet lots of different needs. These chair will sit on top of the bathtub, and they then let the customer use them to get into the bath with ease. These are really useful if your shower is in the bath, and they are usually foldable and easily removable, so you can take them out of the bath when they are not in use. Heavy DutyChairs – Your standard shower chair, these are built to be waterproof, corrosion resistant, and to simply sit in your shower while maintaining maximum support and comfort. These are great all round options, and should be able to suit a wide range of customers. Shower chairs with wheels – For those patients with severe mobility issues and who cannot walk, there are a number of shower chairs with wheels that can be used, this means that they can get in the chair and get to the shower with ease. The issue with these is that they take up a lot of room in the bathroom (you won’t be using it anywhere else, and they can be quite hard to dry yourself in after the shower. Plus, they only work if you have a shower that can when wheeled into, and these certainly won’t sit in a bathtub. We only recommend these if you have the facilities and bathroom design to use them. Shower Seats – These are perhaps the simplest of all the chairs. They are seat or benches that are simply attached to the wall and can fold out when someone needs to use them. They are very good if you have a wall strong enough to support one, and they can be very effective especially if you have a good grab rail nearby. The downside to these is that they need proper installation and tools to do so. Make sure that you can shower in comfort and safety with this great chair. This comes with removable arms, so you can find the comst comfortable fit for you, and it has a nice padded seat and arms to make sure that you feel great while in this chair. The Frame is made of anodized aluminium, so it is protected from both rust and loosing color. This can support weights of up to 300lbs, so it should be suitable for most people. If you are looking for a sturdy, durable and no nonsense chair, we can diefinitely recommend this. This is an essential shower aid for anyone who needs to be seated while they shower. This has a very comfortable ergonomic design, with padding and comfortable grips, and it can take weights up to 300lbs. Each leg also has a rubber non-slip cap for added safety. Corrosion resistant aluminum frame holds everything together, and as it will not rust this is the perfect material for this bathroom aid, and it has unique drainage holes incorporated into the design to let the water flow through it and onto the shower floor, so you won’t have to worry about grimy water or mold and mildew building up in the chair. 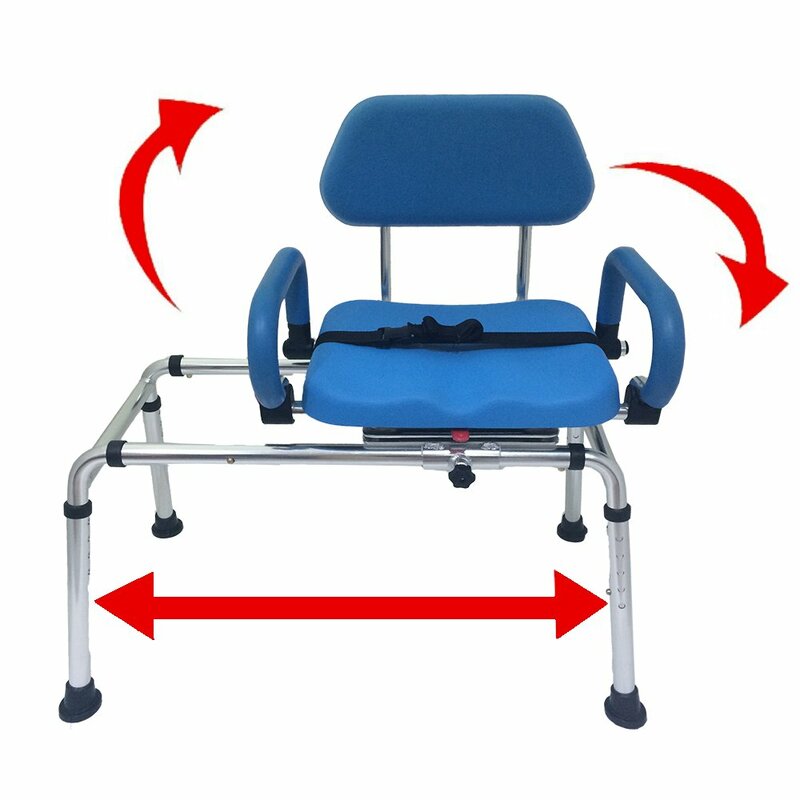 Although very strong, this is a nice lightweight chair that can be assembled and adjusted without any tools, and the arms and back rest can be easily removed if that will make it more comfortable to use. Make sure that showering is always a relaxing and pleasurable experience with this great chair. If you need a bit of help staying on your feet in the shower, then we are happy to introduce you to the ultimate in mobility self-empowerment. With this chair, showering will be safe, carefree and pleasant. 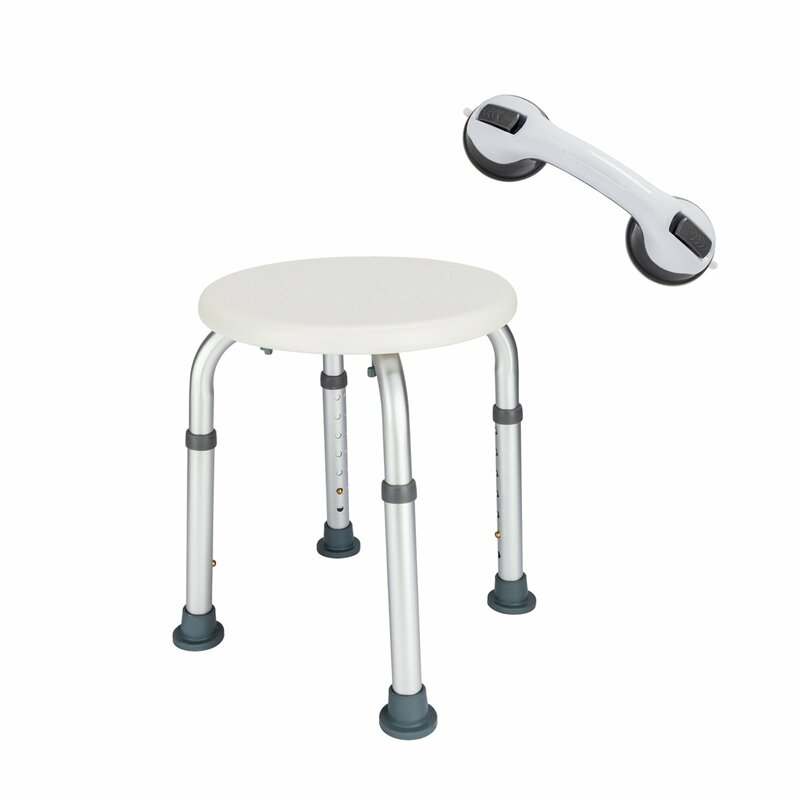 To assist you with your mobility and balance, this state of the art seat has been specially designed so that users of all shapes and sizes will feel comfortable using it, and its lightweight design comes with large and stable legs capped by non-skid feet, ensuring you are safe and secure at all times. 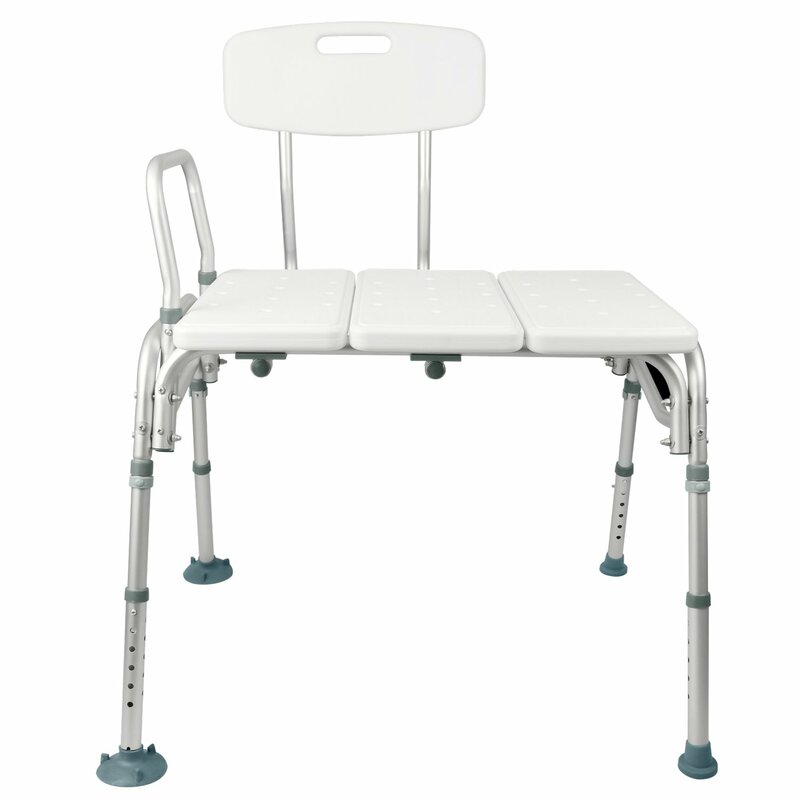 The height can easily be adjusted, and the back, arms and even legs are removable, letting you customize the seat to your own preferences and also easily break it down for storage or transport. Don’t let your mobility issues get in the way of your personal hygeine with this durable and dependable chair. 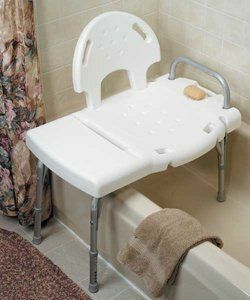 For those who need a little help getting into and out of the tub, this transfer chair is top of the line and specially designed to help you with just that. If you shower is in your bathtub, this might be the best shower aid for you. This is brilliant for seniors, as it comes partially assembled and requires no tools in order to put everything together; it should take about ten minutes to do so. It is both lightweight and durable, and the back and arms are reversible, so this should be able to fit any tub with ease. You can also adjust the height of the legs to get it just right for your shower. The frame is corrosion resistant, and the plastic parts can be cleaned with normal disinfectant, so this product will be easy to maintain and clean properly, while its 30 drainage holes make sure that water flows through and off the chair. 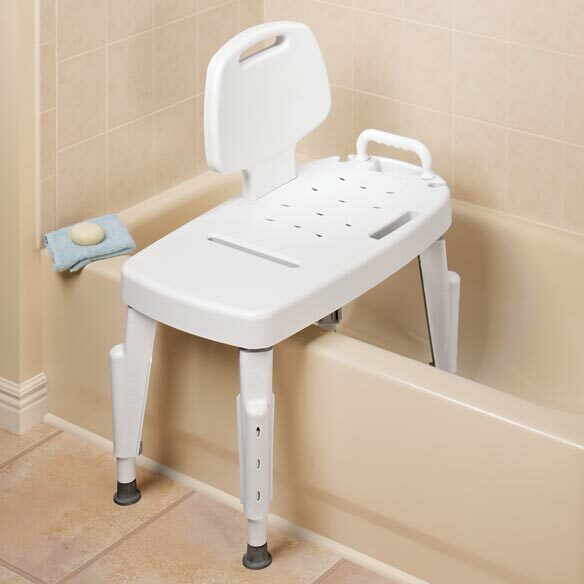 As safety is always the prime concern with a shower aid, this has a non-skid, non-slip bench to keep you secure, an each leg has a stable non-slip cap for added protection, so it won’t skid even on a smooth and wet bath surface. For those who have their shower and bath combined, this will get you in and out in safety and comfort. 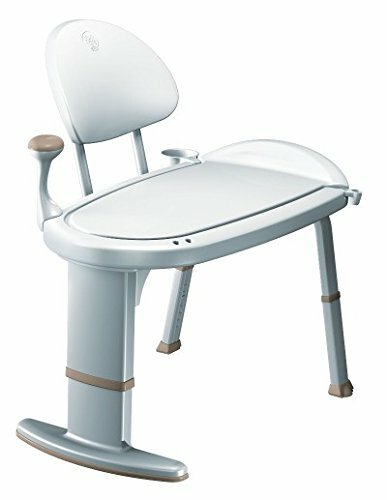 Looking for a sturdy and heavy duty chair for use when bathing? You’ve come to the right place. For anyone with mobility issues or injury that make standing for a long time difficult, this chair will let you shower independently with ease. What makes this model stand out is that it has been made with a heavy-duty anodized aluminum frame, and this has a weight capacity of 300lbs. It also includes a high-density, anti-bacterial polyethylene seat with padded armrests brings, that will bring both comfort and hygiene to your showering experience. Frail and fragile users will definitely appreciate the added support of this chair. As with most chairs, the arms are removable, and the height can be adjusted. If you need a shower bench but feel like you need something a bit more sturdy than the usual, this might be the chair for you. While most transfer benches expect the user to slide themselves across so they can get into the shower, this one takes all the effort out of that, as the seat is on sliding bars, so you can easily move yourself over with minimal exertion. This will definitely be a top pick for those with severely limited mobility, weak grip, strength those who simply don’t want the hassle of having to shuffle themselves across a transfer bench. This comes with a unique and very innovative design, and it will sit in your tub just like any other transfer chair. The padding on the chair is very comfortable, and its strong rust-proof aluminium frame will keep you supported and secure with weights up to 330lbs. All surfaces are easy to clean and disinfect, and you can adjust the height of the chair without tools. For those with severe mobility issues, this is a must have bathing aid. Help stay safe, stable and comfortable as you get into and out of your tub or shower with this dependable and durable transfer bench. 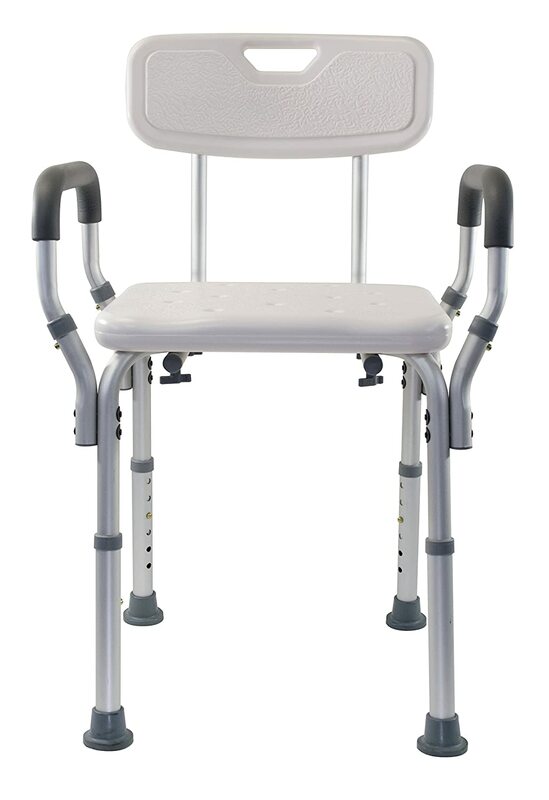 This can support weights of up to 400 pounds, and its 33 inches by 18 inches.non-slip seat is sturdy and comfortable. You can adjust the height between 16.5 and 21 inches, so this will be great for many different kinds of tubs and also users of all shapes and sizes. Safety support handle gives you some extra stability when transferring, and it even has a handy basket for toiletries and other shower essentials. Best of all, it can be adjusted so as to face either way. We recommend this one for heavy users, as this has a weight capacity of up to 400lbs, which is considerably more that the normal 300lbs. If you don’t need anything fancy and a simple stool will do for your shower, this cool package will be great for you. 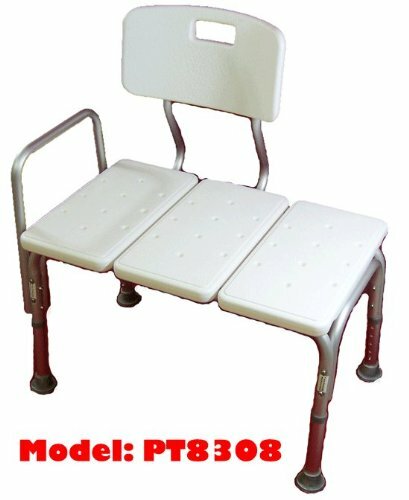 This FDA approved bathing chair can take weights of up to 300lbs, and its strong metal legs with anti-slip caps will make sure that you are safe and secure, even on a smooth and wet bath tub floor. The seat is specially designed with contours to make it extremely comfortable to sit on, and it also has perfectly placed drainage holes in order to let the water run off and not clog things up with grime and mold. The height can also be adjusted. 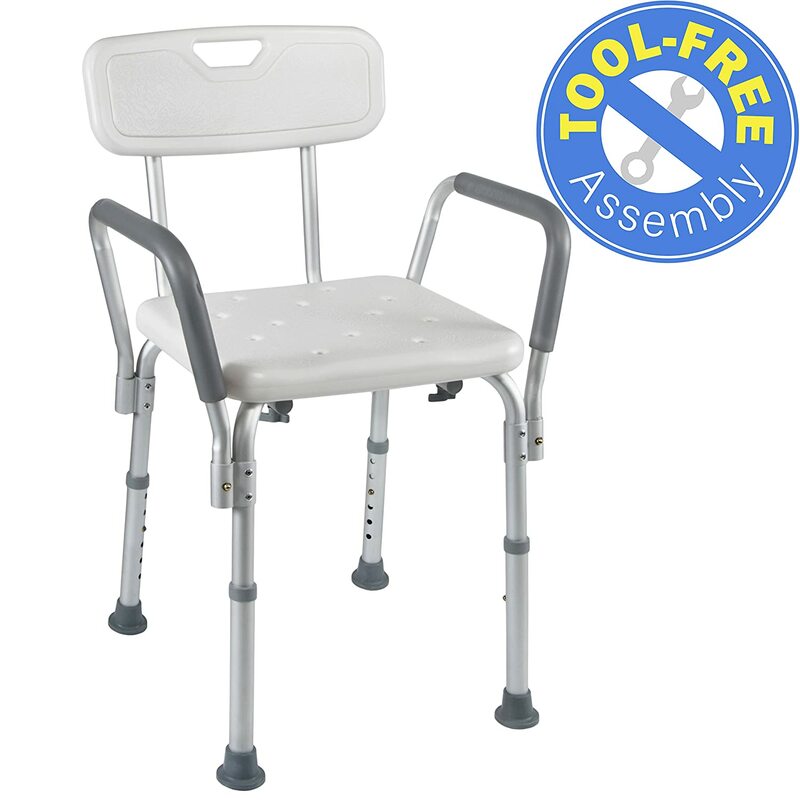 This also comes with a suction grab bar free, so this is a great value for money backage and will be a great deal if you don’t need a heavy duty chair or a transfer bench. Looking for an easy and safe way to get of your wheelchair and into the tub? This great transfer chair can do just that. This will fit into just about any size of tub we can imagine, and it has a very secure and strudy desing that will not only give you security and confidence in the shower, but it will also be a durable chair that will last a long time. The height is adjustable, to help you customise it perfectly for your body, and you can also remove the back rest if that helps. 5 Levels of height adjustment from 16 1/2″ to 20 1/2″. Dimensions 29”(L) X 16”(D) X 25”(H w/o back rest). For anyone who has a sower big enough to take a chair with wheels and especially for those with extremely limited mobility, this might be the best shower chair for you. You will be able to easily move into and out of the shower with this chair, and its frame has been constructed from anodized rust free aluminum in order to ensure that you can use it for many years to com. It also has a waterproof PVC back rest and a comfortable vinyl seat, so you can be comfortable and take as much time in the shower as you wish. The seat height is 21 inches, seat size is 16 by 16 inches, and overall size is 24 by 22 by 34 inches. If you have the space and the need for this, this might be the best shower chair with wheels we’ve seen.